বিভিন্ন সময়ে প্রসিকিউটরদের হেয় করে কথা বলেছেন বাঁকা স্বভাবের সাকা, বলেছেন ‘পার্সিকিউটর’। বলেছেন, গত আড়াই বছর ধরে আমার সঙ্গে যা করা হয়েছে তাতে কি ‘পার্সিকিউটর’ বলবো না তো কি হাজী সাহেব বলবো? This item has been recorded here as part of ICSF's Media Archive Project which is a crowd sourced initiative run by volunteers, a not for profit undertaking to facilitate education and research. 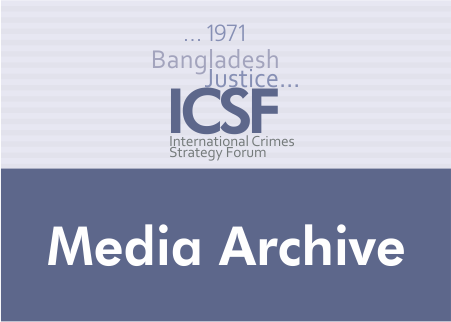 The objective of this project is to archive media items generated by different media outlets from around the world - specifically on 1971, and the justice process at the International Crimes Tribunal of Bangladesh. This archive also records items that contain information on commission, investigation and prosecution of international crimes around the world generally. Individuals or parties interested to use content recorded in this archive for purposes that may involve commercial gain or profit are strongly advised to directly contact the platform or institution where the content is originally sourced.